For my fourth CSA pickup of this year (I am so behind on posting these by the way) we got to pick the usual herbs, plus green beans and lots of flowers. 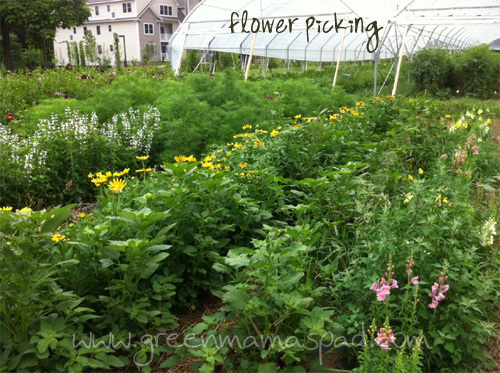 When we first joined our CSA last year I was pleasantly surprised that we got to pick fresh flowers. I wasn't expecting that at all and it is so nice to have a fresh flower bouquet in my kitchen. Unfortunately I forgot to take a picture of all my loot which included carrots, zucchini, cucumbers, tomatoes, sweet corn, eggplant, lettuce and so much more. But here are some shots from me doing my picking. 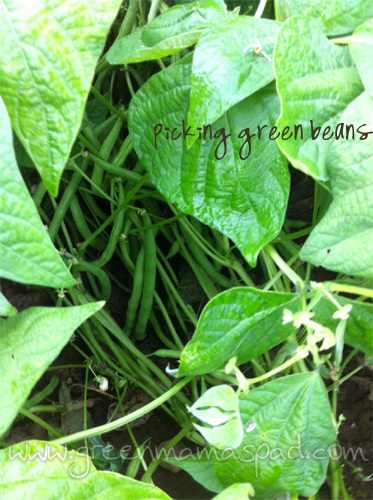 I was able to pick a huge bag of green beans, which requires a lot of bending. My back hurt but they were delicious! 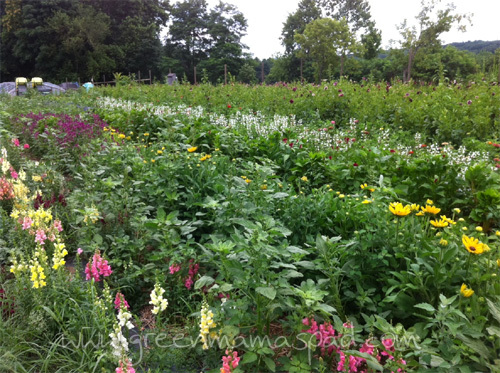 The flower fields have rows upon rows of flowers and I am clueless as to the names of most of them. So pretty! I ended up picking a bunch of the flowers that you seen on the bottom there. I think they are snap dragons. 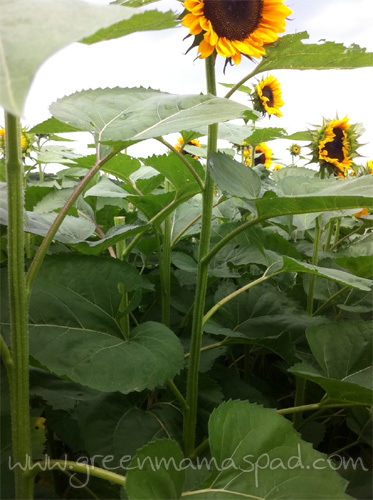 Then I made my way over to the sunflower fields where we were allowed to cut 5 flowers. The outer rows had pale yellow petals and I wanted the darker yellow ones that were on the inside. So deep into the fields I went. I felt like Children of the Corn. I took the above 2 pictures at eye level to try and capture just how tall these things were. I won't be going that deep into the fields again. 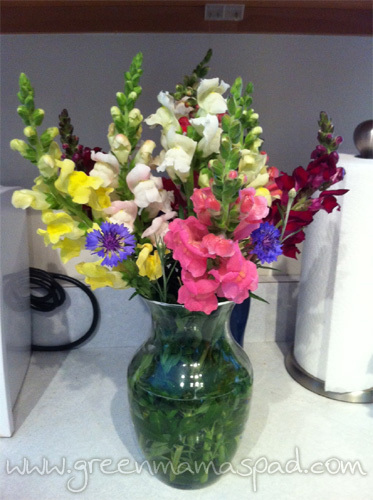 The bouquet of snap dragons I ended up with. 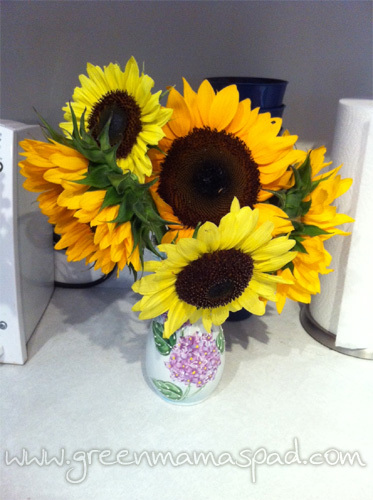 And the bouquet of sunflowers. You can see the two different colors of petals here. Join me next week as I post pickup number 5! Then I will be up to date. Lots of goodies to be seen and eaten. They really are! I h ave 1 lone one growing in my yard. The deer seem to enjoy eating them. 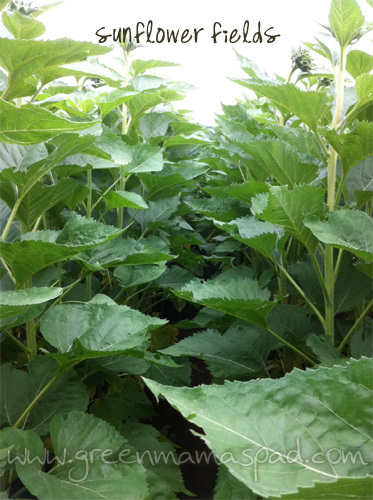 So pretty, we did a sunflower u-pick last year, very cool! 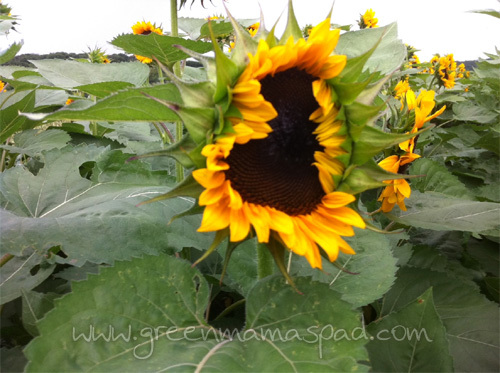 I love sunflowers beautiful post! The sunflowers are sooo cheery!! I want some sunflowers (and I live in Kansas, the sunflower state LOL!!) But we have too many woods around my house to grow them. Looks like a beautiful day! Oh my gosh, how cool! I totally wish we had a CSA around here.